The image of the London flowergirl lingers in the popular imagination today primarily because of the writing of George Bernard Shaw who created the most famous of East End flowergirls, Eliza Doolittle, in his play “Pygmalion.” Subsequently transformed by Alan Jay Lerner and Frederick Loewe into the musical “My Fair Lady,” and filmed with great success by George Cukor starring Audrey Hepburn, the romance of the flowergirl has seduced the world. Yet there was a vivid historical reality behind Shaw’s fiction that was less glamorous but equally revealing of human nature. To complement my portraits of two contemporary flowersellers Tony Purser of Fenchurch St Station and Finty Chester of Columbia Road Market – I am publishing this account of two flowersellers by Henry Mayhew from his “London Labour & London Poor,” 1851. Sunday is the best day for flowerselling, and one experienced man computed, that in the height and pride of the summer four hundred children were selling flowers on Sundays in the streets. The trade is almost entirely in the hands of children, the girls outnumbering the boys by more than eight to one. The ages of the girls vary from six to twenty, few of the boys are older than twelve, and most of them are under ten. Of flowergirls there are two classes. Some girls, and they are certainly the smaller class of the two, avail themselves of the sale of flowers in the streets for immoral purposes, or rather, they seek to eke out the small gains of their trade by such practices. Their ages are from fourteen to nineteen or twenty, and sometimes they remain out offering their flowers until late at night. The statement I give is of two orphan flowersellers, the elder was fifteen and the younger eleven. Both were clad in old, but not torn, dark print frocks and they wore old broken black chip bonnets. The older had a pair of old worn-out shoes on her feet, the younger was barefoot, but trotted along, in a gait at once quick and feeble – as if the soles of her little feet were impervious, like horn, to the roughness of the road. The elder girl has a modest expression of countenance, with no pretensions to prettiness except in having tolerably good eyes. Her complexion was somewhat muddy, and her features somewhat pinched. The younger child had a round, chubby, and even rosy face, and quite a healthful look. Her portrait is here given. The elder girl spoke not at all garrulously, but merely in answer to my questions, “I sell flowers, sir, we live almost on flowers when they are to be got. I sell, and so does my sister, all kinds, but it’s very little use offering any that’s not sweet. I think it’s the sweetness as sells them. I sell primroses, when they’re in, and violets, and wallflowers, and stocks, and roses of different sorts, and pinks, and carnations, and mixed flowers, and lilies of the valley, and green lavender, and mignonette. The best sale of all is, I think, moss-roses, young moss-roses. We do best of all on them. Primroses are good, for people say, ‘Well, here’s spring again to a certainty.’ Gentlemen are our best customers. I’ve heard that they buy flowers to give to the ladies. Ladies have sometimes said, ‘A penny, my poor girl, here’s three-halfpence for the bunch.’ Or they’ve given me the price of two bunches for one, so have gentlemen. I never had a rude word said to me by a gentleman in my life. I never go among boys, I know nobody but my brother. In answer to my inquiries their landlady assured me that these two poor girls were never out of doors all the time she had known them after six at night. “I buy my flowers at Covent Garden, sometimes, but very seldom, at Farringdon. I pay 1s. for a dozen bunches, whatever flowers are in. Out of every two bunches I can make three, at 1d. a piece. We make the bunches up ourselves. We get the rush to tie them with for nothing. We put their own leaves round violets. The paper for a dozen costs a penny, sometimes only a halfpenny. The two of us doesn’t make less than 6d. a day unless it’s very ill luck. The brother earned from 1s. 6d. to 2s. a week, with an occasional meal, as a costermonger’s boy. Neither of them ever missed mass on a Sunday. I now give the quantity of cut flowers sold in the streets. The returns have been derived from nurserymen and market salesmen. It will be seen how fully these returns corroborate the statement of the poor flowergirl, “it’s very little use offering anything that’s not sweet.” I may remark, too, that at the present period, from the mildness of the season, wallflowers, primroses, violets, and polyanthuses are almost as abundant as Spring sunshine. George Bernard Shaw played upon the perceived moral ambiguity of the flowergirl in “Pygmalion.” While Eliza Doolittle protests her virtue by declaring, “I’m a good girl, I am,” her father is entirely amenable to prostitute his daughter to Professor Higgins for whatever he can get. 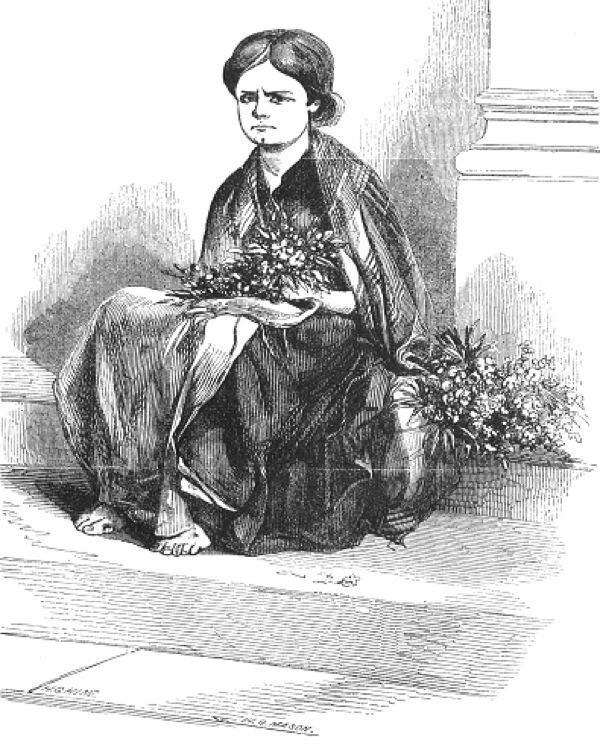 Henry Mayhew’s testimony confirms the historical veracity of this ambivalence, while emphasising that the majority of flowergirls struggled to scrape a living by selling flowers and chose to retain moral dignity in spite of their poverty. And the cathartic moment in Shaw’s play when Eliza throws Professor Higgins’ slippers to the floor dramatises this crucial assertion of self-esteem. Speaking with Tony Purser on the day of his retirement as a flowerseller after fifty-two years, I was surprised to learn of his early arrests for flowerselling without a licence. It reminded me that the lack of distinction between street traders and beggars – categorising all street people as low-life – which existed in the nineteenth century, persisted well beyond the Victorian era. I was inspired to meet Finty Chester, a contemporary Sunday flowergirl, who attends college in the week studying for a professional career, though the irony of our age is that even as a full time student, she also needs to run a flower stall to support herself. Seventeen year old Finty Chester, twenty first century flowergirl, is studying media with a view to pursuing a parallel career as a journalist. 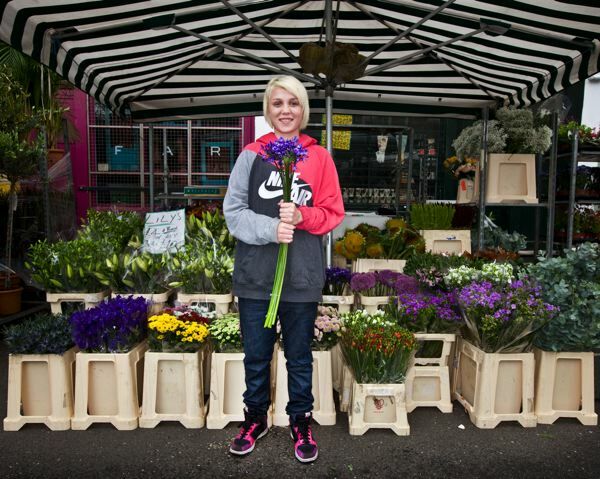 This story reminds me of a different type of flower girl that I saw in the 1930′s. When I was young my parents often took me for a day by the seaside at Walton-on-Naze. On the return in the evening 4 carriages of the train left Walton and 6 left Clacton, the two halves of the train were joined at Thorpe-le Soken for the return to London. While the train was being coupled young girls ran up to the carriages with bunches of Sweet Peas that they offered up to the passengers at 3d. a bunch, they did a brisk trade. I do not think that todays nanny state would allow children to trespass on the railway but no child ever suffered. i saw the drawing and immediately thought henry mayhew. thanks for providing just what i was looking for. The idea of flower girls extends beyond English literature and London. Perhaps it constitutes something universal. Any visitor to Thailand or Asia will be accosted by flower girls. The British tourist who has read GB Shaw will be aware of the ambiguous nature of flower girls; in fact, their friends are other “workers in the night”, such as prostitutes. Those who have read Charles Dickens’ Oliver Twist will also know that street workers are often criminal gangs. In Asia, and also Europe, it seems that many sweet, innocent flower girls are forced into their profession by a Dickensian villain. Why else would a nine year old girl sell flowers at 1 am when she should be going to school the next day. One may guess the ‘truth”. They can’t return home before they have sold all there flowers or they will be beaten. I sold roses on the streets of Paris from 1987 – 1989. I bought 20 wrapped them in cellophane and sold them round restaurants and bars. They cost about 2 francs each and I sold them about 10 francs each. When I had sold about 15 or 16 I stopped work and went to the bar to meet friends but kept enough money aside to buy more roses the next day and pay my rent and food. I sometimes got stopped by the police but never arrested. The other rose sellers were at that time North African or Gypsies, they were always kind to me – warning me where the police were. Some of the other rose sellers were men and some were women with children.